This entry was posted in Genealogy - Tips, Help & Links and tagged Arlene Stafford-Wilson, Bathurst Township, drummond township land records, Ferguson Falls, Lanark County books, Lanark County Genealogical Society, Lanark County genealogy, lanark county history, Lanark County land records, Perth, Perth history, Perth Military Settlement land records, Perth Ontario, Perth Ontario history, St. Patrick's Roman Catholic Church. Hi, great resource! I was wondering if you had any clues for using the land petition. 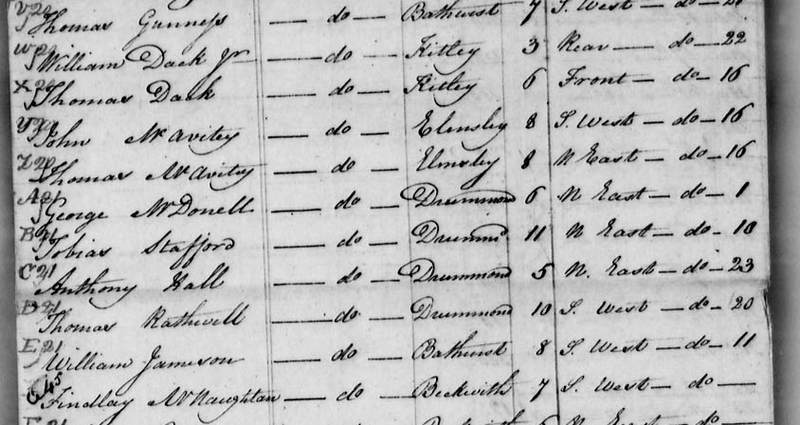 I was able to look up my supposed ancestory (Henry Bradfield), but I found two entries – one in the town of Perth and the other in Drummond. I’m wondering whether this is definitely two different people, or is it possible that he would be granted one lot in town and one in the country? Just wondering if anyone else has encountered this. Thanks! Hi Chris. Could these be adjacent land grants? The town of Perth is in Drummond Township, so one lot could technically be in the town of Perth ‘proper’, and the second, outside the town boundaries in the Township of Drummond. If they were not side by side, it could be that the soldier or petitioner was granted more than one lot. Depending on military rank, the higher the rank, the more 100 acre sections a soldier would be entitled to receive. Hope that helps. It might be worth sending a query to Archives Lanark. They are extremely helpful with this type of query. Hi Arlene, thanks for the suggestions! I’ll contact Archives Lanark and see what they say.